Maya is interested in helping disadvantaged women in Nepal and is committed to seeing them empowered and educated, so that they are in a position to stand up for their rights. Maya is able to empathise with issues women face in Nepal, having grown up in the rural district of Sindhupalchok, an area well known for human trafficking. Considered a rebel within her community for running away from home to escape a forced marriage when she was fourteen, Maya is now considered an inspiration for all women in Nepal. 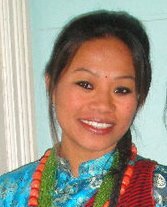 As part of an expedition in 2008, Maya, at the age of 28, became the first woman from her Gurung community to reach the summit of Everest, as part of a women’s team called the Seven Summits Women sevensummitswomen.org. Their mission was to scale seven mountains in seven continents, which they successfully achieved in December 2014. After the earthquake in April 2015, the team became heavily involved in the rebuilding of rural schools and running a feeding program to ensure that school children receive a meal every day. They also train trafficking survivors as guides. WONDERWorks is very grateful to have Maya on our own team, as both a dedicated supporter and wonderful role model for the girls and women we strive to help.